Induction of pluripotency from somatic cells by exogenous transcription factors is made possible by a variety of epigenetic changes that take place during the reprogramming process. The derivation of fully reprogrammed induced pluripotent stem (iPS) cells is achieved through establishment of embryonic stem cell (ESC)-like epigenetic architecture permitting the reactivation of key endogenous pluripotency-related genes, establishment of appropriate bivalent chromatin domains and DNA hypomethylation of genomic heterochromatic regions. Restructuring of the epigenetic landscape, however, is a very inefficient process and the vast majority of the induced cells fail to complete the reprogramming process. Optimal ESC-like epigenetic reorganization is necessary for all reliable downstream uses of iPS cells, including in vitro modeling of disease and clinical applications. Here, we discuss the key advancements in the understanding of dynamic epigenetic changes taking place over the course of the reprogramming process and how aberrant epigenetic remodeling may impact downstream applications of iPS cell technology. Somatic cell reprogramming is carried out by exogenous expression of four pluripotency-associated transcription factors, c-Myc, Oct-4, Klf4 and Sox2, known as 'Yamanaka' factors. The groundbreaking experiment that identified the minimal requirement of these four transcription factors screened 24 essential embryonic stem cell (ESC)-expressing genes by retroviral introduction into mouse embryonic fibroblasts . This is pioneering study utilized the neomycin resistance gene knocked into the endogenous Fbx15 locus as a reporter of reprogramming. Upon isolation of ESC-like G418 resistant colonies, detailed characterization demonstrated a transition of differentiated cells to pluripotency, although attempts to generate adult chimeric mice were unsuccessful. This initial report stressed the importance of epigenetic remodeling during the acquisition of pluripotency and demonstrated that key endogenous pluripotency genes such as Nanog and Oct-4 acquired transcriptionally permissive chromatin structure at their promoters, characterized by DNA hypomethylation, histone H3K9 demethylation and acetylation of histone H3. However, it was immediately clear that inherent heterogeneity exists among cells undergoing the reprogramming process and significant differences between established induced pluripotent stem (iPS) cell and ESC transcriptomes were evident. Two subsequent studies utilized an improved selection protocol by selecting for the expression of Nanog or Oct-4 rather than Fbx15 [2–4]. Using the Nanog selection strategy, Mikkelsen and colleagues  identified two distinct reprogrammed iPS cell populations, with Nanog selection at later reprogramming stages (that is, day 30 post-infection) enriching for more ESC-like, fully reprogrammed iPS cells. Appropriate downstream applications of iPS cells for developing in vitro disease models or therapeutic purposes are absolutely dependent on the fact that artificially derived iPS cells do indeed behave like ESCs under the same conditions. To this end, the finding that Nanog selected iPS cells are different and of higher quality than the Fbx15 selected iPS cells underlined early on the importance of selecting the right reporting strategy to isolate and characterize the iPS cells of the highest quality. Indeed, genome-wide transcription analysis revealed wide-ranging changes in gene expression between the two selection processes . Furthermore, markers of complete reprogramming are not exactly the same in the mouse and human systems; for instance, Nanog reactivation in human iPS cells does not specifically mark fully reprogrammed iPS cells, and alternative markers, such as DNMT3B  and perhaps hTERT expression levels , are better indicators of this developmental stage. On the other hand, retroviral silencing of the reprogramming factors is a common occurrence in completely reprogrammed mouse and human iPS cells [1, 5, 6, 8, 9]. Our lab has recently developed a lentiviral EOS reporter vector for the isolation and expansion of pluripotent stem cells, although EOS enriches for, but does not specifically mark, fully reprogrammed mouse iPS cells . In the human iPS cell system, multiple markers of full reprogramming may need to be utilized, including iPS cell colonies of desirable morphology, gene expression and cell surface marker expression, such as Tra-1-60 and SSEA4. However, since generating chimeras is not an option in the human iPS cell context, these surrogate markers together with teratoma formation are likely to remain the most stringent way to demonstrate full reprogramming. Robustness of somatic cell reprogramming using 'Yamanaka' factors is evident when considering the sources of somatic cells used in reprogramming experiments, including liver and stomach , blood , pancreas  and the intestine . The requirement for the exogenous factors is variable depending on the starting cell type, with a recent paper reporting the derivation of iPS cells using only Oct-4 in neural stem cells . Collectively, these findings demonstrate that the epigenetic landscapes that characterize different somatic cell types can be reorganized using a similar cocktail of transcription factors as the initiator of reprogramming, with Oct-4 playing a central and seemingly irreplaceable role in the reprogramming cascade. It remains to be determined whether somatic cells of different tissues of origin have distinct epigenetic structures that are more permissive to the derivation of fully reprogrammed iPS cells. Alternatively, there may be elite subsets of cells that are more epigenetically predisposed to reprogramming that are yet to be discovered . However, a recent study by Hanna and colleagues  demonstrated by single cell sorting of terminally differentiated secondary mouse B cells that every cell has the potential of giving rise to Nanog-green fluorescent protein activated iPS cell populations, albeit at different reprogramming rates, indicating that somatic cell reprogramming involves stochastic mechanisms. Although induced pluripotency is dependent on exogenously introduced transcription factors, the epigenetic changes that take place during reprogramming are the driving force of a gradual transition to the pluripotent state. The pioneering studies provided the evidence that, in the mouse system, transition to pluripotency is accompanied by global epigenetic changes. We view these changes as a seven headed dragon, with the heads representing: 1, epigenetic reactivation of endogenous pluripotency genes, such as Oct-4 and Nanog; 2, establishment of bivalent chromatin domains at developmental loci and altered histone H3K4 and H3K27 trimethylation levels at ESC 'signature' gene promoters  (bivalent mechanisms are reviewed in ); 3, heterochromatin DNA hypomethylation of satellite repeats ; 4, inactive-X chromosome reactivation in female iPS cells; 5, maintenance of DNA methylation marks of imprinted gene loci ; 6, retroviral transgene silencing upon pluripotency establishment; and 7, the possibility that these molecular epigenetic modifications are accompanied by three-dimensional reorganization of chromatin fiber structures and nuclear subdomain localization (summarized in Figure 1). It is apparent that pluripotent ESCs and iPS cells share distinct epigenetic regulatory pathways, characterized both by the existence of bivalent chromatin domains and extensive DNA methylation marks at non-CpG dinucleotides . Dynamic epigenetic changes characterize the gradual reprogramming process. Four stages of reprogramming are illustrated as differentiated starting cell type (that is, murine embryonic fibroblasts), intermediate, partially reprogrammed induced pluripotent stem (iPS) cells and fully reprogrammed iPS cells. Activation of pluripotency-associated loci results in iPS cells' ability to stably self-renew and precisely control the embryonic stem cell (ESC)-like transcriptional profile. Proper histone methylation levels at the right genomic regions establishes bivalent chromatin domains not necessarily involved in the induction to pluripotency but required for proper differentiation capacity of iPS cells. DNA methylation levels are reduced in female ESC and iPS cell lines at heterochromatic satellite repeat elements. The functional significance of DNA hypomethylation is currently not understood but could be a reflection of the reactivated inactive-X chromosome. On the other hand, DNA methylation marks of imprinted genes remain protected from demethylation and are comparable to the levels in the starting cell type. Finally, it is not known whether extensive epigenetic changes accompanying the reprogramming process result in physical structural changes to the chromatin fibers themselves. It is now well established that at least three classes of cells are derived during reprogramming, termed intermediate, partially (or pre-iPS) and fully reprogrammed iPS cells. However, only the latter two are capable of forming ESC-like colonies that are commonly isolated during the clonal expansion of iPS cell lines. The reprogramming process is a rare event, with initial studies reporting the reprogramming efficiencies in mice of 0.1% of the starting cell numbers giving rise to visible colonies on the induction plates. This is number is even smaller when considering only colonies that are fully reprogrammed with all the epigenetic characteristics of an ESC-like state. Indeed, most of the cells that initiate the reprogramming process fail to contribute to the germline of adult chimeric mice [1, 3, 6, 20]. Even though the establishment of partially reprogrammed iPS cells is undesirable for subsequent differentiation and disease modeling experiments, continued characterization of such cell lines will provide clues as to the various blocks to bona fide reprogramming to occur . When retroviral transgene delivery is used for the reprogramming process, continued dependence on the transgene expression is a hallmark characteristic of partially reprogrammed iPS cells. This is persistent retroviral expression is rarely observed upon endogenous Sox2  or Nanog [22, 23] activation. Genome-wide transcriptional analysis of partially reprogrammed cell lines indicates that activation of ESC-specific genes by the Yamanaka factors requires cooperative interaction with additional pluripotency-associated genes not present in the partially reprogrammed cells, such as Nanog . This is differential binding of transcription factor complexes is not accounted for by the persistence of histone H3K27me3 chromatin marks of the ESC-specific target genes by the four reprogramming factors, implicating additional repressive epigenetic marks. As Oct-4 seems to be the main driving force of the reprogramming process, its association in transcriptional activator or repressor complexes in combination with epigenetic modifying enzymes is worth considering. Recently, Oct-4 was shown to be a member of the Nanog and Oct4-associated deacetylase (NODE) repressor complex consisting of Nanog, histone deacetylase (HDAC)1/2 and Mta1/2 and members of repressor chromatin remodeling complexes NuRD and Sin3A . Knockdown of the components of the NODE complex leads to upregulation of developmentally regulated target genes and ESC differentiation towards the endoderm lineage. Interestingly, an independent study has demonstrated that a member of the NuRD complex, Mbd3 (methyl CpG-binding domain protein 3), is involved in the repression of primitive endoderm and trophoblast-specific genes Gata6 and Cdx2, respectively . In addition, Oct-4 interacts with SetDB1/Eset, a histone H3K9 methyl-transferase, to restrict the expression of extra-embryonic lineage genes in the inner cell mass (ICM) of the developing blastocyst . It would be interesting to determine whether transient overexpression of Eset and the NODE complex remodeling enzymes could increase the derivation of completely reprogrammed iPS cells during the late stages of the reprogramming process. Indeed, various chemical treatments specifically targeting silencing epigenetic regulators of transcription increase the efficiency of induction to pluripotency. Somatic cell reprogramming is proposed to be a stochastic event , requiring precisely coordinated levels of transgene expression at the right time [8, 21], and this inefficiency is at least partly due to epigenetic blocks encountered on the road to pluripotency. This is convincingly demonstrated by the series of experiments in the mouse system using chemical inhibitors of chromatin remodeling enzymes, G9a (histone H3K9 methyltransferase) , HDACs , and DNA methyl-transferases (DNMTs) [2, 28], yielding higher reprogramming efficiencies in a variety of cell types (reviewed in [30, 31]). However, it remains unresolved whether most chemical treatments only increase the efficiency of early reprogramming events yielding a higher number of partially reprogrammed iPS cells. To date, two chemical treatments have been shown to induce the conversion of a stable partial iPS cell line to the fully reprogrammed iPS cell state. These conversions used 5AzaC (a DNMT inhibitor) treatment of B-cell derived iPS cells and the heterogeneous MCV8 iPS cell line  or treatment with a 2i/leukemia inhibitory factor (LIF) inhibitor cocktail targeting mitogen-activated protein (MEK)/extracellular signal-regulated kinase (ERK) and glycogen synthase kinase-3 (GSK3) pathways [24, 32]. However, only 2i/LIF treatment was shown to result in partial iPS cells converting to germline competent fully reprogrammed iPS cells. Since individual partially reprogrammed iPS cells are arrested at different reprogramming stages, clonal lines respond differently to the reported chemical conversion approaches. In fact, Mikkelsen and colleagues  reported that an additional partially reprogrammed iPS cell line, MCV6, responded to the 5AzaC-mediated conversion to the pluripotent state only upon short hairpin RNA knockdown of four lineage-specifying transcription factors. In addition, Chd1, a euchromatin-specific chromatin remodeling enzyme, has been shown to maintain the pluripotent ESC state and its absence impedes the somatic cell reprogramming process . Overall, the data so far suggest that repressive epigenetic modifiers result in various blockades to the reprogramming process. However, it is important to note that chemical inhibition of key epigenetic regulatory mechanisms within specific pluripotent cells may have undesired effects. For instance, inhibition of DNA methylation prematurely in the reprogramming process results in apoptosis of the intermediate cell types  and may induce DNA damage response pathways , while inhibition of HDACs results in differentiation of ESCs . Thus, precise timing of the chemical treatments during the reprogramming process is required to achieve optimal conditions for the induction of pluripotency. Currently, multiple epigenetic hallmark characteristics have been assigned to the fully reprogrammed iPS cell state. Since a wide range of global epigenetic modifications are taking place during the reprogramming process, the question of changes to the physical chromatin architecture becomes an interesting feature to explore. It has been known for a long time that ESC genomes are characterized by a more 'open' chromatin state but its role in pluripotency is difficult to ascertain. A wide range of epigenetic reconfiguration is carried out during the formation of the ICM, including random X-inactivation and resetting of loci-specific histone methylation levels. Therefore, genomic 'euchromatinization' may be a consequence of such epigenetic reprogramming events. However, an interesting possibility to consider is that establishment of more open, plastic chromosome territories within the nucleus is required for the cells of the ICM to respond to differentiation cues properly. Such a physical state would allow for quick reconfiguration of the chromatin state throughout this early embryonic development. This is supported by the fact that nucleosomal proteins are not static chromatin units in pluripotent stem cells, but rather exist in a hyperdynamic state where rapid exchange occurs throughout the cell cycle . The reprogramming stage at which such conformational changes to the chromatin state are established remains to be explored in future iPS cell studies. The process of artificial somatic cell reprogramming using defined factors will undoubtedly have a tremendous impact on the way we study human disease and will likely have applications in the field of regenerative medicine. Currently, efforts are being made to differentiate iPS cells and ESCs down different lineages into somatic cell types by recapitulating the in vivo differentiation cues in vitro [38, 39] (and reviewed in ). Signaling molecules, such as activin A and bone morphogenetic protein, used in differentiation studies are also expressed in the developing embryo. These strategies have provided the proof of concept of the potential use of ESCs and iPS cells in regenerative medicine and disease modeling in humans. In vitro modeling of human disease for small molecule screening will likely become the first use of iPS cell technology for 'real-life' applications. In fact, iPS cell lines have been established from patients with multiple diseases, such as amyotrophic lateral sclerosis , familial dysautonomia , fanconi anemia , rett syndrome , spinal muscular atrophy  and a spectrum of other diseases . Several of these studies demonstrated directed iPS cell differentiation to affected cell types with Ebert and colleagues  and Lee and colleagues  reporting the first successful phenotype improvements using a chemical treatment. However, some concerns are yet to be addressed for widespread modeling of human diseases in vitro. In particular, each of the reports so far has reported a very limited number of established lines, and for disease modeling to be reliably explored, more control and patient lines need to be established in parallel using highly reproducible reprogramming methods. Another issue to consider is the delivery method of the reprogramming factors. The most favorable are non-integrating methods that result in genetically unmodified iPS cell lines. This is especially important if the reprogrammed iPS cell lines will be utilized for clinical applications where reactivation of the reprogramming factors can result in unpredictable phenotypic outcomes, such as cancer development. A wide range of innovative techniques has resulted in successful reprogramming using pMX-based retroviral vectors, lentiviruses, non-integrating adenoviruses, episomal vectors, and plasmid and piggybac transposon systems. Although integration-free reprogramming methods are preferable, we have previously suggested that the use of retroviral transgenes provides a beacon of the completion of the reprogramming process and may be useful in cell lines not used for clinical applications . This is feature has been exploited in numerous iPS cell studies investigating the dynamics of the reprogramming process [1, 21]. Even with non-integrating reprogramming technologies, significant heterogeneity between iPS cell lines may prove to be the biggest obstacle to reliable evaluation of disease phenotypes in vitro. The range of the normal phenotype of a particular functional assay is yet to be determined in multiple disease model settings. Only when the full range has been determined and reproducible differentiation protocols have been established will we be able to model human diseases in culture with a high level of confidence. Overcoming this obstacle may involve determining the inherent variability in the starting population of undifferentiated ESCs and iPS cells. It is unknown whether these variabilities will persist to the differentiated cell state. Although initial reports were highly encouraging as to the similarities between newly derived iPS cells and existing ESC lines, recent studies support thorough molecular characterization of clonal iPS cell lines, suggesting that significant differences between iPS and ESCs remain at both the transcriptional  and epigenetic levels . Inappropriate establishment of epigenetic marks in the undifferentiated iPS cells will undoubtedly yield heterogenous differentiated cells for subsequent applications. In fact, a brief comparison of even human ESC lines demonstrated that differentiation preferences are highly inconsistent among human ESC lines, resulting in variable levels of lineage-specific gene activation . Finally, pluripotent stem cells and adult mammalian progenitor cells have variable expression levels of genes controlling lineage specification . Several genes with variable levels of expression in mouse ESCs have been described, with Nanog  and Stella , to our knowledge, being the best characterized. It remains to be investigated whether proper levels of variability of these pluripotency-related markers are established upon the transition of differentiated cells to fully reprogrammed iPS cells. In the case of Stella, variable gene expression is regulated by reversible epigenetic modifications such as histone acetylation in the ICM, with more long-term repressive epigenetic silencing through DNA methylation occurring at later stages of development, in the epiblast derived stem cells. During these early phases of studying iPS cells, it is important to consider all possible obstacles to the safe and reliable use of iPS cells in these downstream applications . Leading stem cell researchers remain cautious about possible false promises regarding the application of iPS cells. The quality of the starting iPS cell lines for in vitro differentiation experiments may not need to be pluripotent to the strictest criteria, as long as the differentiation of the cell type of interest could be accomplished accurately and efficiently. For this purpose, if one is interested in studying the cell types of the mesoderm lineage, the capacity of the iPS cell line to give rise to ectoderm/endoderm lineages may not be relevant. Even in these restricted directed differentiation experiments, appropriate epigenetic circuitry needs to be established for the lineage-specific genes to be re-expressed upon receiving differentiation signals. Reprogramming of somatic cells progresses through several stages before the full pluripotent state is attained. We describe seven epigenetic features of reprogramming and illustrate their dynamic modifications at the different stages. Small molecules can enhance efficiencies and further promote full reprogramming by modifying the epigenetic landscape. 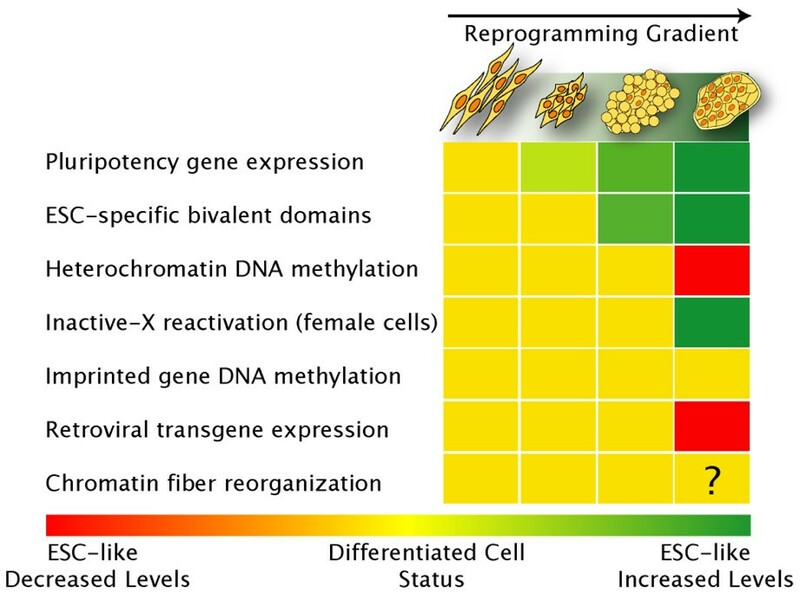 As we transition into large scale efforts to make patient-specific iPS cell lines and model human diseases in vitro, proper epigenetic remodeling may remain at the forefront of stem cell biology, and developing methods to stably establish ESC-like epigenetic circuitry during the reprogramming process will be of high priority. We thank Dr Akitsu Hotta and Aaron Cheung for comments on the manuscript. Research was supported by grants to JE from the Canadian Institutes of Health Research (MOP-81129 and RMF-92090) and the Ontario Ministry of Research and Innovation. UD was funded by an Ontario Graduate Scholarship and the Hospital for Sick Children Restracomp.